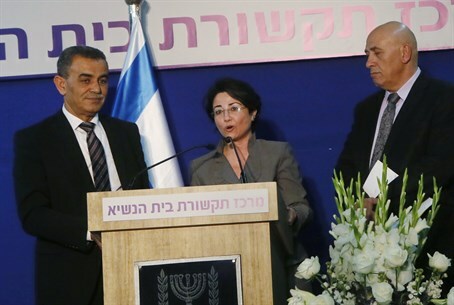 Balad MKs Hanin Zoabi, Jamal Zahalka and Basel Ghattas confirmed that they flew to Qatar on Wednesday, just days after denying they visited the country where Hamas leaders are serving in exile. In letter sent to the Knesset Ethics Committee, which is headed by MK Yitzhak Cohen (Shas), the three Knesset members claimed that they could not report on the trip beforehand for "technical reasons." "The Policy Research Center in Doha funded a trip, and I was on my way home," said MK Ghattas. "It was impossible for me to report to the Ethics Committee before the trip, and this is for technical reasons, asI needed to procure a State of Qatar visa, which was delayed until the last minute,"
Both Zoabi and Zahakla made similar claims. The Policy Research Centre belongs to former MK Azmi Bishara. Bishara is still wanted for questioning in Israel for transmitting information to Hezbollah. Until the 2011 passing of the "Bishara Law," the former MK was still receiving full pension from Israel, getting a total of 500,000 shekels (roughly $143,000). Cohen demanded that the three MKs provide explanations for their absence, following dozens of complaints from right-wing MKs demanded that he, as well as Attorney General Yehuda Weinstein, examine in-depth the source of financing for the trip. Qatar is known not only to be hosting Hamas's leaders in exile, including Khaled Meshaal, but to be openly supporting Hamas's terror on Israeli civilians.